Juan Marichal and Willie Mays during Marichal’s rookie season with the Giants. When Juan Marichal stepped on the mound for the first time as a big leaguer, it was the first major league game he had ever seen. Nine innings later, he had made one of the most spectacular debuts in baseball history, and launched a career that would land him in Cooperstown. Walter Johnson made his first big league appearance for the Senators on August 2, 1907, and drew the assignment of facing the hard-hitting Tigers. Detroit attacked Johnson’s psyche before the game started. Several players razzed Johnson as he warmed up, calling him a “hayseed” and a “country bumpkin.” The first batter to step in against Johnson was Tigers’ leadoff man Davy Jones, who recalled that the first pitch Johnson delivered was “the fastest ball I ever saw.” Johnson retired the side in the first and then faced Ty Cobb to lead off the second frame. Cobb tested the youngster immediately, dragging the first pitch toward first for a perfectly placed bunt single. Johnson took the loss 3-2, but it was just the first of many battles between Johnson and Cobb in the years to come. Robin Roberts was famous even before he made his major league debut. A star baseball and basketball player at Michigan State University, the future Hall of Fame pitcher signed a $25,000 bonus contract with the Phillies in 1948. On June 18, the 21-year old debuted in Philadelphia against the Pirates. He delivered on his promise, hurling eight innings of five-hit ball before leaving for a pinch-hitter. Giving little indication of his future as the game’s greatest slugger, Babe Ruth debuted as a promising young left-handed pitcher for the Red Sox, on July 11, 1914. Facing the Highlanders (later known as the Yankees), Ruth pitched the Sox to an 11-5 win, delivering a double to help his cause. The man who would win more games than any other pitcher in baseball history made his debut on August 6, 1890, for the Cleveland Spiders of the National League. Cy Young, carrying the nickname “The Canton Cyclone,” stymied the Chicago Colts (precursor of the Cubs) on three harmless singles, shutting down future Hall of Famer Cap Anson’s team, 8-1. Hitters have made a big splash in their debuts as well. One of the finest debuts in history was turned in by Willie McCovey on July 30, 1959, in San Francisco. McCovey was a heralded prospect, having paced the Pacific Coast League with a .377 average and 28 homers prior to his call-up. On that day he hit third in the Giants’ lineup, sandwiched between Willie Mays and Orlando Cepeda. 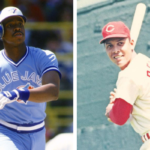 The three future Hall of Famers helped the team to a 7-2 win, with McCovey lacing four hits, including two triples. “Big Mac” scored three runs and drove in two, playing first base while Cepeda moved to third. Earl Averill blasted a home run in his first major league at-bat, off Detroit’s Earl Whitehill on April 16, 1929, in Cleveland. Averill became the first player to hit a homer in his first at-bat and later earn induction to Cooperstown. Reliever Hoyt Wilhelm matched that feat, but he did it four days after his major league debut as a pitcher, on April 23, 1952. It was the only home run of Wilhelm’s career. In his debut, Padres’ outfielder Dave Winfield collected his first major league hit the hard way. He slid head first into the bag for a single off Astros’ lefty Jerry Reuss to lead off the ninth inning, on June 19, 1973, in San Diego. 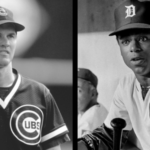 Interesting intersections also occur in the debuts of Hall of Famers. One of the most famous debuts occurred in Philadelphia on April 14, 1925, when two future Hall of Famers took their first steps toward Cooperstown on the same team. Connie Mack wrote the names of Lefty Grove and Mickey Cochrane in his lineup that day for the first time, Grove as the starting pitcher, and Cochrane coming in as a defensive replacement behind the plate. Grove, labeled a “$100,000 Beauty” because of the steep price Mack paid for the left-hander, pitched into the fourth inning, and left in a 6-0 hole. Cochrane entered the game in the eighth inning, and ended up delivering a single in the bottom of the 10th frame that set up the A’s winning score. Mack’s “$150,000 battery” had made their debut. Only one date in history saw as many as three future Hall of Famers make their major league debuts. On Opening Day of the 1956 season, April 17, Frank Robinson debuted for the Reds in Cincinnati, Don Drysdale debuted for the Dodgers in Brooklyn, and Luis Aparicio did the same for the White Sox in Chicago. Aparicio collected a hit off Bob Lemon, and Robinson stroked two hits in his first look. In Hank Aaron’s major league debut on April 13, 1954, Opening Day in Cincinnati, future Hall of Fame third baseman Eddie Mathews blasted two home runs. It was the first two of the record 863 homers the pair would hit as teammates. In the game that saw pitcher and future Hall of Fame manager Tommy Lasorda debut for the Brooklyn Dodgers, on August 5, 1954, Stan Musial had one of the greatest games of his career, hitting two homers and driving in seven runs for the Cardinals. Lasorda faced Musial in the seventh inning and limited him to a sacrifice fly. President Franklin D. Roosevelt attended the first major league game ever played by future Hall of Fame shortstop Phil Rizzuto, on Opening Day in Washington D.C., April 14, 1941. “Scooter” drew a walk and turned two double plays in the field for the Yankees. The first batter versus pitcher matchup for some Hall of Famers was noteworthy. Twenty-year old Ted Williams debuted in Yankee Stadium on April 20, 1939, lining a double off Red Ruffing. Sandy Koufax’s first strikeout victim in the major leagues was Hank Aaron. Koufax came on in relief for the Brooklyn Dodgers on June 24, 1955, in Milwaukee’s County Stadium, pitching two shutout innings and fanning two. The first strikeout victim of Gaylord Perry’s career was Frank Robinson. The first two batters faced by Nolan Ryan in his career were Eddie Mathews and Hank Aaron, on September 11, 1966. Neither of them struck out against Ryan, not that day at least. Braves’ pitcher Warren Spahn was tested immediately in his debut. Pitching against the New York Giants on April 19, 1942, the future Hall of Fame southpaw faced formidable opposition from the outset. The first two batters Spahn faced as a major league pitcher were Mel Ott and Johnny Mize, both of whom earned plaques in Cooperstown. Spahn walked Ott and retired Mize on a grounder to first base. Speaking of Mize, he played a role in the debut of another future Hall of Famer. Walter Alston reached Cooperstown on his managerial record, but he had a very interesting major league debut as a player. Late in the 1936 season, on September 27, Alston, a prospect with the St. Louis Cardinals, got his first and only taste of major league action when Mize was ejected for arguing with the first base umpire in the seventh inning. In his only major league at-bat, Alston struck out against Cubs’ right-hander Lon Warneke. Eighteen years later, Alston was back in the big leagues, managing the Brooklyn Dodgers. Richie Ashburn hit second in the Phillies order behind Sparky Anderson in Sparky’s major league debut, on April 10, 1959, while fellow future Hall of Famer Robin Roberts was on the mound for the Phillies. Roberts earned the win when Anderson drove in the deciding run in the 8th frame. A few Hall of Famers made auspicious debuts, barely recognizable in the box scores, yet significant nonetheless. Ozzie Smith made his debut on April 7, 1978, playing three innings at shortstop and grounding out in his only at-bat against San Francisco’s John Montefusco. Smith was removed for a pinch-hitter, but his glove was too valuable to keep him out of the lineup that first season. On his first night in the big leagues, Padres’ manager Roger Craig recognized Ozzie’s amazing defensive abilities. “Ozzie has shown me he can play shortstop in the majors. I’ve never seen anyone with better hands, or quicker hands and feet,” Craig said. On August 7, 1915, future Hall of Fame outfielder Sam Rice made his major league debut as a relief pitcher for the Senators. Rice pitched regularly his first two seasons, before settling in as an outfielder. In his debut, he had unusual defensive help – future Hall of Fame pitcher Walter Johnson started and played right field in place of the injured Washington regular. Lou Gehrig made his first major league appearance on June 15, 1923, pinch-running for Wally Pipp, whom he would eventually replace as the Yankees’ first baseman. Gehrig would hold a firm grip on the position for 2,130 straight games, though his consecutive games streak would not begin until 1925. Sometimes rookies get no respect at all. Pie Traynor didn’t get a chance to play for the Pirates until the final days of the 1920 season, in the second game of a doubleheader on September 15. Even then, he didn’t start the game, but came in as a defensive replacement for Bill McKechnie. An unknown rookie, Traynor was listed in newspaper accounts and the box score as “Trainor.” He did collect his first major league hit that day, and within a few years everyone in the National League knew how to spell his name. One of the most significant debuts by any player occurred on April 15, 1947, in Brooklyn’s Ebbets Field. Playing first base that day for the Dodgers was Jackie Robinson, the first African American to play in the majors in modern times. Robinson batted second in the Brooklyn order and was 0-for-3, but he was involved in the Dodgers’ three-run rally in the seventh inning, which proved to be the winning margin. Robinson dragged a bunt toward first base which Braves’ first baseman Earl Torgeson fielded but threw away into right field. Two days later in similar fashion, Robinson collected his first major league hit, a drag bunt against the Braves. In that same game, on April 17, 1947, future Hall of Famer Duke Snider made his major league debut. Playing left field, Snider collected a single and scored a run, but it was another rookie who stole the spotlight – Johnny “Spider” Jorgensen, who had a monster day, driving in six runs on a home run and two doubles. On that day it was “Spider” not “Snider,” that had Dodgers’ fans talking.